Queston: I like to eat nuts but probably eat too many of them. How much should I eat and which nuts are the best to eat. Should I eat them roasted or raw? Answer: Nuts are a great snack but they are a calorie dense food. While they offer good nutrition for the calories they possess, too many of them will contribute to your waistline. The most nutritious nuts are the raw ones, not the roasted versions and especially not the roasted, flavored types. Nuts are filed with healthy omega-3 fats, protein and minerals. Typically, a handful provides 160 to 200 calories. 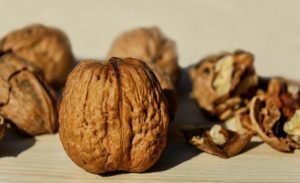 Walnuts are considered the most heart healthy nut containing the highest amount of omega-3’s. They have a high fat content and should be refrigerated after the shells are removed to slow spoiling. 14 walnut halves provide 185 calories. Almonds have a light flavor and are very high in magnesium and calcium which promotes healthy bones. They are also high in protein and 23 almonds is about 160 calories. Peanuts are actually a legume which provide a different set of aminos and protein. They have the highest ratio of protein of all the nuts and are a good source of folate which promotes healthier blood cells and nerve function. 28 peanuts total about 170 calories. Pistachios contain the highest amount of potassium, vitamin A and B6 making it a very healthy choice. Additionally, it contains zeaxanthin, a carotenoid that helps prevent macular degeneration. 48 pistachios equals 160 calories. Cashews are the lowest in fat of the nuts and contain high amounts of magnesium and iron which are necessary for energy and red blood cells. 16-18 cashews contain 160 calories. One Brazil nut contains 100% of your daily requirement of selenium which is a powerful antioxidant. Too much of it isn’t good so restrict your Brazil nut intake to 6 nuts which is 186 calories. Both pecans and macadamia nuts are higher in saturated fats and contain the lowest amount of protein. These aren’t recommended except occasionally. Nuts contain a variety of nutritional pluses but are high in calories so eat them but only in limited amounts.